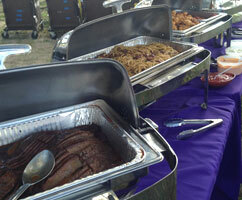 We pride ourselves on adapting our catering business to match your every need. Contact us today so we can help you plan your next special occasion. Good food + good times. 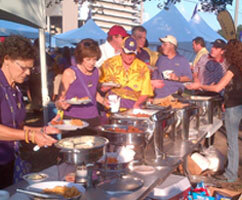 Any sporting event can be enhanced with our wide selection of mouth-watering foods. Just sit back, relax, and let us make your next party a huge success! Holiday planning doesn't have to be stressful! Let us handle the hard work with our extensive catering services. We can do it all! From planning the event to the final wrap-up of the event, you can now enjoy your holiday event stress free! Let's make your next workplace event something special and memorable! Contact us today to find out how we can customize your party to meet your expectations for any work related occasion. Catering for school or educational functions can be hectic, but they don’t have to be! We'll work diligently with your staff to make sure you get the service and delicious food you need, no matter how large or small the event. IN A TIME OF NEED.. The funeral reception allows family and friends to continue spending time together sharing memories and comfort. Allow us to assist you and your loved ones during this difficult time by preparing the food and providing the appropriate service to you and your family. This is a time when you have many items to address and catering is something that we can take care of for you. Call us and together we can plan a menu and discuss services we can provide. Whichever you choose, we can arrange it on your behalf.